I like what you did with the Flying Geese blocks. 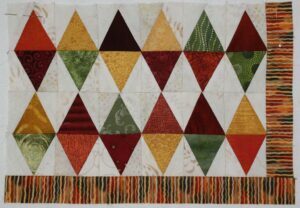 I’m still in the early stages of my Long Time Gone quilt. Thanks for the inspiration. 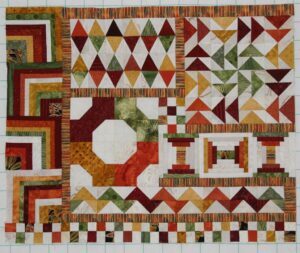 One of my favorite things about making this quilt was deciding where the different fabric colors would be placed in each block. 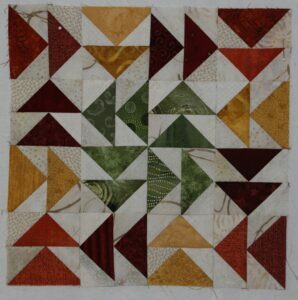 It really gives a quilter the opportunity to make the quilt their own. I know that you will have as much fun (and frustration) building your LTG as I did. Thanks for stopping by. I like your color range that you are using. Thank you. 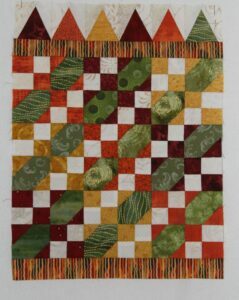 Originally I was going to use my Oriental fabric, but at the last minute I changed my mind and decided to use autumn colors. I am very happy with the way it is looking.